Kip Farris is survived by his brother; Kris Farris of Denver, children Briel Farris of Pittsburg and Kayla Van Cleve of Plano, Texas; and three grandchildren. A memorial contingent will participate in the Carnival Parade on Memorial Day weekend. 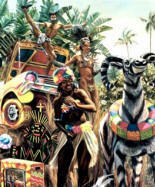 One of Carnaval San Franciscos' great artists passed away during the 2006 Carnaval season. 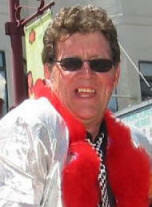 Kip Farris for many years saved his best for his first passion, Carnaval San Francisco. His great talent for pleasing, inspired, larger than life design delighted many millions of viewers over a course of twenty years of parade float design. A world traveler, Kip Farris was particularly taken with Brazilian culture and their Carnaval arts. 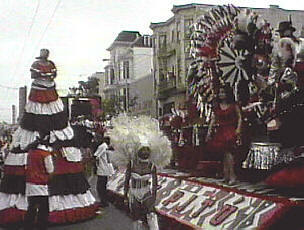 Kip moved to the Bay Area in the late 1980s following an initiative by the director of the San Francisco Convention and Visitor's Bureau, John Marx to lift the two most entertaining San Francisco parades to a level where they, as world class events unto themselves, could act as significant visitor attractions for San Francisco's main industry. Afterwards, the Chinese New Year and San Francisco Carnaval parades were greatly enhanced by Kip's playful whimsy and inspired knowledge of the artistic themes which stirred the Italian Renaissance. From 1989 through 2003, Mr. Farris designed most of the floats in the Chinese New Year parade. He would be responsible for nearly all the standout floats in the Carnaval parade during this period. Kip was an artist in his hometown of Denver when in 1983 he was asked to submit designs for Denver's annual Parade of Lights. Born in Beaumont, Texas, in 1944, Mr. Farris earned was inspired to pursue an art career while stationed with the military in northern Italy. Returning to Denver, he earned a bachelor's degree in fine arts painting, and early on gravitated to getting his work before a wide audience in Denver as both a a muralist and participant in operating an art gallery. For many years, Carnaval San Francisco would benefit from Kip's better paying gigs like the Chinese New Year Parade, and Denver Christmas Parade of Lights. Kip's enthusiasm for Carnaval would find him spending all he made plus go into deficit to create something unforgettable for the Carnaval in the Mission. One year, this even included floats he created for a parade/car chase scene in the film "Jade,"
Kip was an artist who sought beauty in the moment, he had been in failing health for several years. The former Denver-based artist, who died Dec. 20 at age 61 in a Richmond, Calif., hospital of a chronic respiratory illness. Mr. Farris, who was born Nov. 18, 1944. 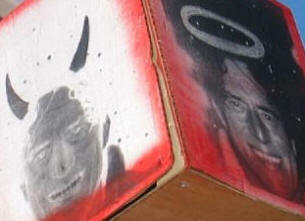 Kip Farris designed over 600 floats in his long career of bringing art to the people in the streets. Kip loved Carnaval but hated how he would lose his financial shirt particularly when he decided he wanted to win the competition for best Carnaval group with his contingent Batu Pitu. 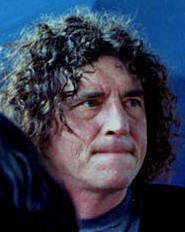 Thus during the mid-nineties, Kip Farris, was also responsible for producing full scale Batu Pitu street productions with choreographed dancing, a band and floats. 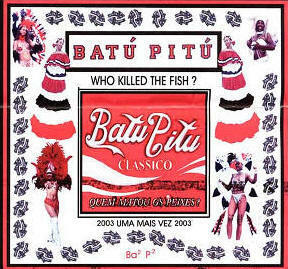 He stepped back from Carnaval during the years of current artistic director, Roberto Hernandez absense(1996-2001) As his health began to fail him, Kip attempted to relive this glory with a resurrection of Batu Pitu in 2003 but it was not to be. The giant Baianas, the largest float ever on the streets of San Francisco, the powerful use of red, black & white, the drama of Kip crossing the Bay Bridge Carnaval morning with his caravan of Carnaval float and still being on time are all memories that will live forever for some of us. He began painting huge murals on buildings in Denver and founded the parade-float company The Floatworks in 1983. 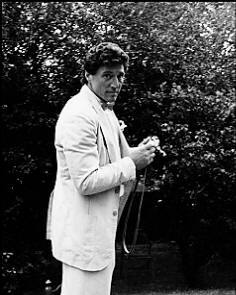 He also opened an early alternative-art space here in 1975 (the 1418 16th Street gallery) and was co-founder of the underground publication The Rocky Mountain Oyster. The gallery opening was the beginning of the lower downtown art scene, a time of experimentation and growth. "Kip and I shared a studio in the same building," said Karl Isberg, who with Farris helped found both the gallery and, later, the Oyster. "There was nowhere around town for cutting-edge artists to show their work." Mr. Farris was "just a quixotic, creative, wonderful guy," said Isberg, editor of The Pagosa Springs Sun. Much of the lower downtown art scene has been "blown away by time," said Mr. Farris' brother, Kris Farris, who lives in Denver. And so has much of Mr. Farris' work. "Murals are tough," said Kris Farris. "They don't weather well and businesses change." Mr. Farris' murals basically have disappeared. Mr. Farris was born in Beaumont, Texas. His family moved here when he was a year old. He attended North High School and enlisted in the Army in 1964. During his service, he earned a GED and spent time in Italy, where Kris Farris said his brother was influenced by the work of masters such as Michelangelo and Carravagio. When he returned to Denver after his tour of duty, he studied art at both Regis College and Metropolitan State College of Denver. "He was a problem-solver," said sculptor Robert Mangold, who was among Mr. Farris' teachers at Metro. "He was probably a better designer than a fine artist, but he was very motivated. He was a very good student." After his brother's death, Kris Farris said he and his wife gathered up many pieces of his work in California. "To see decades' worth of art astounded me," said Kris Farris. "His talent and artistic integrity amazed me." That included projects for Floatworks. "He was trying to fight keeping the floats from being billboards and not artistic." Former Denver artist Jud Hart, who has lived in the Bay Area for several years, agreed. "Kip was a master of diverse media, from painting to sculpture to computer graphics. Over the years, these skills were reflected in his parade float designs - sometimes to his regret, as he often felt locked in by the parade float 'business,' hyper-bohemian operation that it was. "Still, he managed to create a unique body of artworks. He was a generous, sometimes lovable, curmudgeon located on the personality curve somewhere between Hunter S. Thompson, minus the guns, and Charles Bukowski in his barfly days."